It's the start of another contest week in the #WranglerSunChaser promo and the pressure in crafting the photo that shall win the ultimate prize is getting higher. Last week, participants are not only chasing the grand prize of winning an all-expense paid trip to their country of choice, they also had the chances of winning PhP8,000 worth of Gift Certificates once chosen as the Photo of the Week in the Asia Pacific region. This week, more chances to win prizes have arrived! I am giving away PhP2,000 worth of Wrangler Gift Certificates in two very simple and very quick social media tasks. 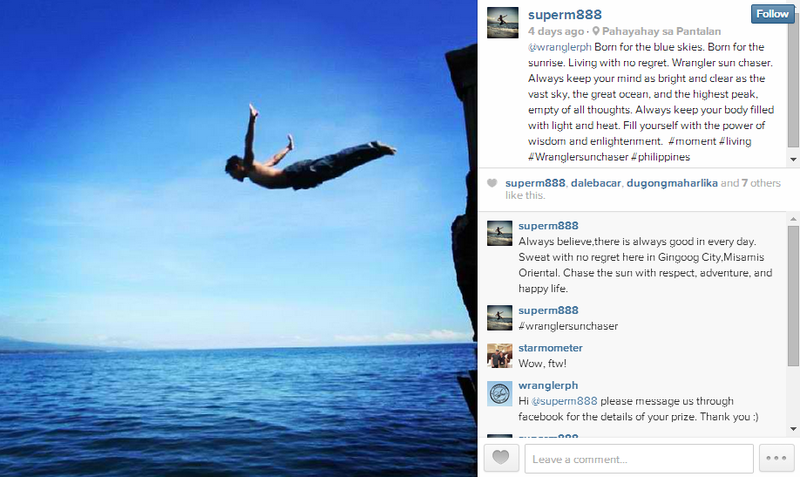 Participants just need to like Wrangler's official Facebook page (www.facebook.com/WranglerPH) and regram or repost my promo photo on Instagram. They can write their own caption for as long as @mj_deleon is tagged. The tagging of course is for easy monitoring of the participants. The promo will start today, April 28 and will end on Mother's Day Sunday, May 11, at 6PM. Entries will be electronically raffled off. Once we randomly picked a winner on May 11, we will request for his/ her Facebook account to check if he/ she has liked Wrangler's FB page. If this part of the instruction is skipped, another electronic raffle will be held. It's as easy as the alphabet. 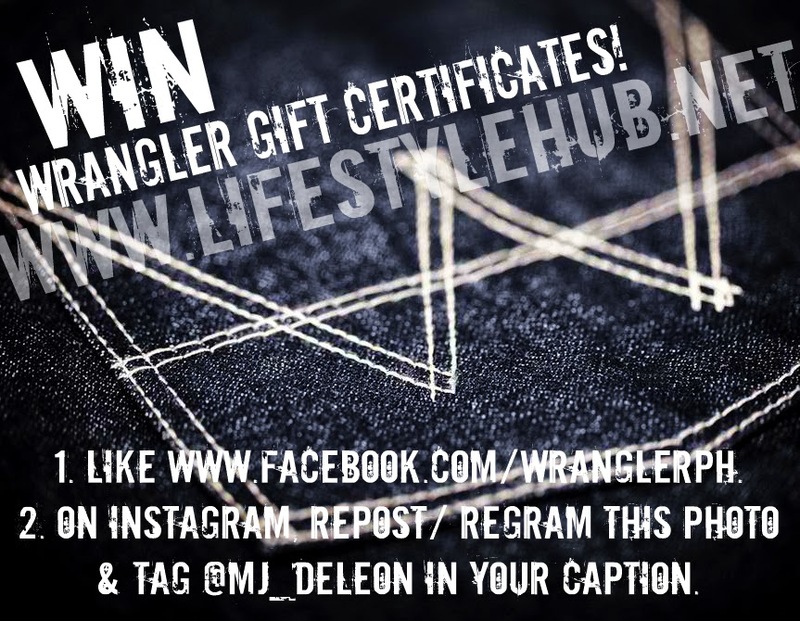 Like Wrangler's FB page and regram my promo photo and you have the chance to get new items from Wrangler by winning gift certificates! 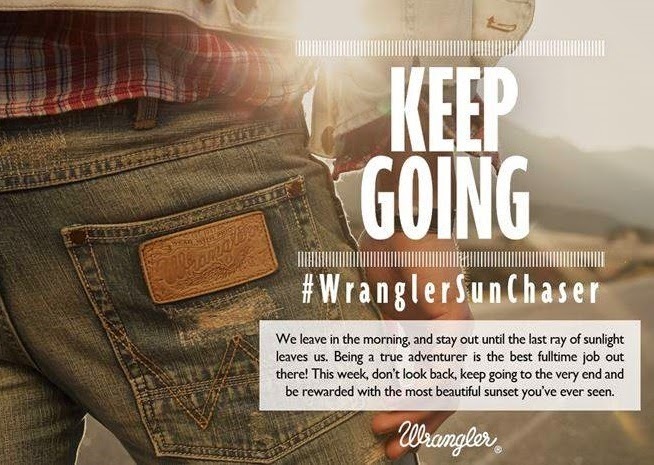 Meanwhile for the third week of the Wrangler Instagram challenge, the theme is #KeepGoing. Follow the instructions in the photo below and I hope you'll win this time. Good luck! P.S. Here's last week's winner for the theme #StayCool.